The haunted history of the Fort Garry Hotel is very appealing to those that reside and live in Winnipeg, Manitoba Canada. In the year of 1913, this hotel was constructed by the “Grand Trunk Pacific Railway”. The original purpose and intent of the hotel was to provide a comfortable means of lodging for those that would come in by train. The name was derived from an area that was close to the establishment called the “Upper Fort Garry”. The hotel was considered to be exquisite in architecture style and design and was well adored by travelers. 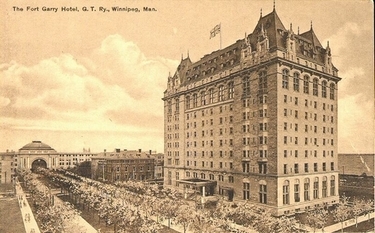 Here, you will learn the haunted history of the Fort Garry Hotel. The Fort Garry Hotel is an incredible building. It is actually twelve stories in height, and hosts three hundred and forty rooms for guests who visit the structure. Each and every single room was constructed with a private bathroom. This was a rarity during the time that this hotel was constructed as most hotels had community bathrooms that guests had to share. It also came complete with a ballroom, a musician room, a concert hall, and more! In addition to this, this establishment was considered to be self-sufficient in that it had a bakery, well, press, and more! It was designed to be a city in itself! When it comes to paranormal activity, quite a bit seems to occur in the Fort Garry Hotel. Several guests have reported a wide range of hauntings. One of the most common types of hauntings that are said to occur involves apparitions appearing at the ends of beds in which the guests stay. Reports of both a male and a female apparition have been documented. It is believed that both of these spirits are from the earliest days of the hotel, when several people were in and out of the establishment on a regular basis. While tracing of the spirits has been attempted, there is no conclusive evidence on who the ghosts may be, or why they may remain in the hotel. There is one particular room in the hotel in which legend tells of a female that actually hung herself in the closet. Tragic news had been relayed to the woman the day that she decided to take her life into her own hands. That day, her husband who was the love of her life, had been tragically killed in a car accident. She was so overwhelmed by her despair that she took her own life on that very day. She could not bear with living one day without her husband, so she believed that she could join him death. Unfortunately, it seems as if her spirit never left the building. Many guests who have stayed in the room, room 202, have stated that they have seen the woman, appearing to be in a mournful state, wandering around. She does not appear to be troublesome, only sad and as if she is searching for something. In addition to apparitions, several sounds that cannot be accounted for have been heard throughout the establishment. Rooms, such as the dining room, that had been locked have had terrible sounds emerging from them. Upon investigation, no one was found to be in the area. There are several other unexplained events that also take place in the hotel. These events include the sounds of crying, mourning, and talking that cannot be explained. If you are searching for haunted places to go, and will be in the area of Canada, you should check out the Fort Garry Hotel. You are sure to get a taste of the haunted history for yourself! Check for the lowest price, get directions, view photos, and read the reviews and traveler tips for the Fort Garry Hotel.